Binghamton University now has a Center of Excellence building worthy of its title. 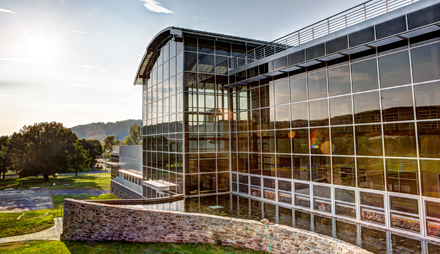 The Small Scale Systems Integration and Packaging center (S3IP) and its interdisciplinary teams of engineers and scientists recently moved into a new $30 million glass, metal and stone building. The facility joins the Engineering and Science Building and Biotechnology Building at the Innovative Technologies Complex on Murray Hill Road in Vestal. A fourth building, the Smart Energy Research and Development Facility, is under construction and expected to open in 2017. President Harvey G. Stenger joined this week with Sen. Thomas W. Libous, Assemblywoman Donna A. Lupardo, University faculty and staff, industry partners, community leaders and members of the public to celebrate the opening of the 114,000-square-foot Center of Excellence building. S3IP, which was designated a Center of Excellence in 2006, connects industry and academia. Key research thrusts include electronics packaging, energy-smart electronic systems, flexible electronics and energy harvesting and storage. Stenger said the project, which generated nearly $16 million in economic impact and supported more than 180 jobs, would not have been possible without the support of the senator and assemblywoman. The Center of Excellence was designed by the University’s in-house architect, William Hall. It was built to LEED standards, and features energy-efficient windows and skylights as well as a water retention system and the latest technology for heat recovery and humidity control. It took three years to build Binghamton’s Center of Excellence, but you can see it go up in two minutes in this time-lapse video .